One, four, nine, sixteen. These are the magic numbers in Mel Bartholomew’s method of square foot gardening. In this edition, you will learn more time and money saving ideas with the “Tip” boxes strewn throughout the pages. The numbers represent how many plants you can put into a square foot of garden space. You might already be using his method without knowing it. Raised beds (boxes) filled with a rich organic mix are the key to success in this system. You have to know that Mel tells you just how to make that mix he calls “Mel’s Mix.” He also supplies you with grids and cautions you to keep the boxes a manageable size so that either you can reach across easily to harvest or not so long that it is a chore just to get to the other side. In the back of the book, there are extremely helpful charts showing just when and what to start early indoors and when to put those seeds or plants into the ground, not by date but by days to or from frost, so the charts work everywhere. His “At a Glance” section chronicles some of the more commonly backyard-grown flowers, vegetables, and herbs. If you want to know how to grow cabbage, beets, even asparagus there are full instructions on raising these crops. Mel also cautions about waiting too long to harvest, as in the bean section, “Pick beans when they are still small and tender. Do not allow them to get so large that pods bulge with seeds; the plant will stop producing and the best flavor is past.” He even has information on how to grow lettuce in the summertime. You can easily fit in more plants in less space in the SFG gardening system, making it perfect for the smaller backyard garden. Key to raising good crops is the soil. Be sure to fill the boxes with a good organic mix. Then every time you fill a square foot with new plantings, add fresh compost or mix to the bed. This new version is published just as his Square Foot Foundation is starting to take shape. Bartholomew, with a staff versed in the square foot method, are bringing square foot gardens to community gardens, public and civic spaces, and school yards across the country. Even special needs gardeners are addressed in this edition. Mel suggests that you will grow a whole lot more vegetables using his system of raised planting boxes than you would if you use the traditional row gardening. If you have less than ideal soil, and few of us have a perfect garden bed, raising the plants above the old soil and filling them with an ideal growing medium will give you many hours of enjoyment and many pounds of vegetables. 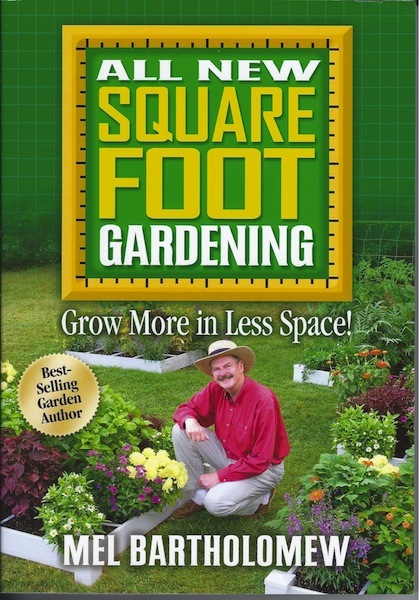 Read the revised “All New Square Foot Gardening.” It is a good place to start. Paperback available from booksellers everywhere. Published by Cool Springs Press.